Apr 14th, 2019 06:43 AM Hourhighyield.com pays instant. $6.91 has been successfully sent to your Bitcoin account 18rNmTLBBNVrigNPx9DY5fphvHrkSjWigv. Transaction batch is e209c5da3f8bf31d7c48f7b70db5a80253fb153f7792d98a0e6a141daaa39df4. 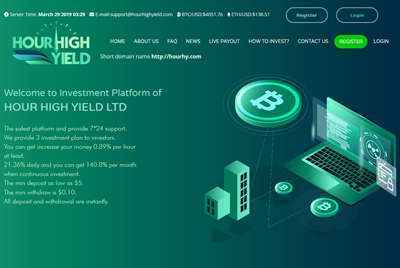 Apr 13th, 2019 04:15 AM Deposit to HIGH HOUR YIELD LTD from Vanohyip! 10 USD has been withdrawn from your account: U15393***->U2607700. Memo: Shopping Cart Payment. Deposit to hourhighyield.com User Vanohyip. Date: 04:32 13.04.19. Batch: 255595826.